Urban Sketchers Seattle: The 5-Day Challenge! At the moment, there is a cool 5-day challenge going where you are nominated by another sketcher to post 3 sketches a day for 5 days, and nominate another sketcher to do the same each day. Today I was nominated for the '5 day drawing challenge' by my Urban Sketcher friend Béliza Mendes, whom I met at the USk Paraty Symposium 2014 and I will get to see again this summer for the DRAW CIVITA workshop in Italy. 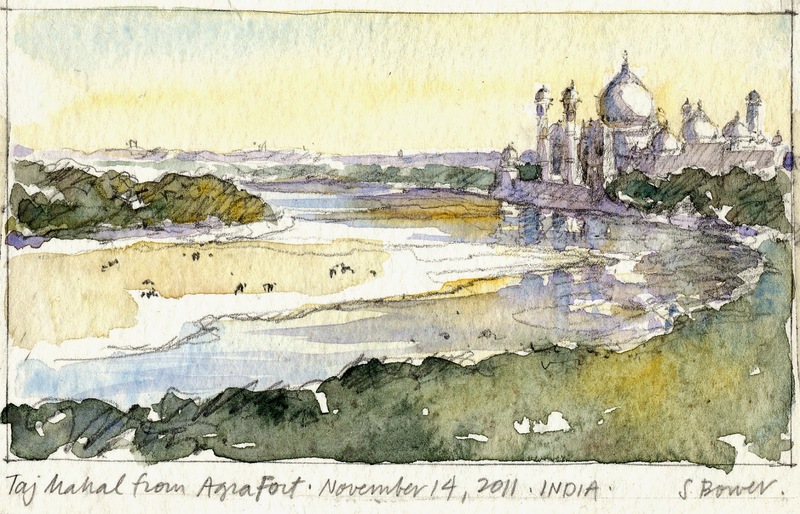 "Day 1 of 5: I go back three years to India, where I started sketching in earnest again. The sketches from that adventure quite literally changed my life and have since opened so many doors! These are mostly pencil sketches, with touches of watercolor, as I could never get used to painting in the Moleskine sketchbooks I had with me. But these sketches still bring back the vivid colors, sounds, tastes, and the people of India. I'd go back in a heartbeat. Today I nominate Suhita Shirodkar, from India now in California, whom I met and spent time with in Brazil--I love her sketches! My fingers are crossed that we will get to teach a workshop together soon!" I invite you all to follow along and check out the Facebook USk group! Namaste. path of more travel, sketching, and teaching. In Varanasi, India, our B&B overlooked the Ganges, so I got up before dawn every morning and sketched on the rooftop deck, watching the city and river come alive each day. Utterly Amazing. bar in the river are cows. These are exquisite, Stephanie. I've been watching this challenge as it races around facebook. Very fun.